The fine dining institution starts afresh with a relocation to One Fullerton and a new culinary team spearheading a collaborative direction. There’s a misconception that a restaurant with a great view offers little else. Although this thinking may apply to tired revolving restaurants with cliché-ridden menus and slick rooftop bars with underwhelming food, Saint Pierre tells a different story. The move from Sentosa to One Fullerton brings a stunning panorama of Marina Bay to the table, but most importantly highlights an essence-centric menu envisioned by chef-owner Emmanuel Stroobant. Elegant interiors by acclaimed designers FBEYE International visually address the shift in direction for the fine dining establishment. Since the changes were unveiled last April, more innovation has come to the fore courtesy of newly-appointed executive chef Mathieu Escoffier. The 29-year-old French chef has worked at top kitchens around the world—from Alain Ducasse in Paris to Daniel Boulud in New York, and most recently at Joel Robuchon in Bordeaux. Head chef KimKevin De Dood and pastry chef Jonathan Allaert also recently joined to complete the kitchen team. Given the restaurant’s reputation and the high calibre of both the kitchen and front of house staff, expectations can be stratospheric. One is assured of a top-notch experience they moment they arrive; the welcome is warm and polished, allowing one to immediately relax in the intimate 30-seater restaurant. In terms of food, the most dominant transformation is the increased focus on essences, which entails reducing and presenting the strongest, purest flavours on a plate. Dishes such as wild seabass with tomato, shallot and tamarind embody chef Stroobant’s “flavours to the fore, techniques behind” approach. This devotion to flavour, however, is most evident in the wild mushroom ravioli with pan-fried maitake, vermouth sauce, onion purée and porcini dust—it’s essentially a medley of mushrooms cooked and presented in different ways. The dish is earthy and enriching, every bite offering a fascinating take on an ingredient so often overlooked. The arrival of chef Escoffier heralds a collaborative direction for Saint Pierre that sees the essence-centric approach meet with increased experimentation. 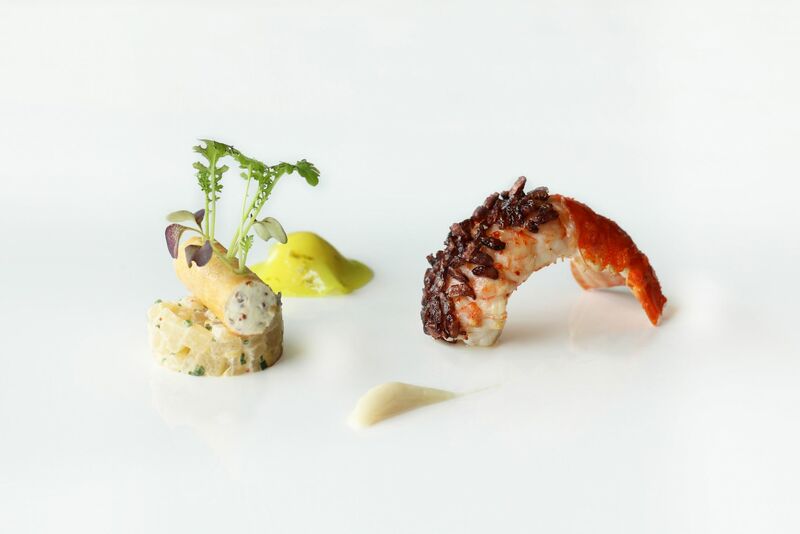 While still upholding the finest French techniques, chef Escoffier and chef Stroobant meld their creative styles resulting in dishes such as langoustine with wild puffed rice, winter melon, celeriac, green apples. The plate is a sight to behold, second only to the lovely textural and subtle flavour combinations. There’s also a welcome deviation from their French repertoire in the form of a pork main inspired by the Peranakan dish babi buah keluak. The tender 12-hour sous vide Iberico pork is placed alongside the buah keluak, which features an addictive blend of pulled pork, foie gras, nashi pears and herbs. It’s a clever way of fusing local and French flavours—resulting in a dish that’s familiar and yet surprising at the same time. Both dishes feature in the revamped ‘Nature’ and ‘Earth’ menus, available in six and ten courses. The final courses of cheese and dessert signal a return to traditional European style, with the former served in the restaurant’s signature cheese trolley. Things like these feel like a rare treat in today’s dining landscape, which is characterised by a plethora of ultra-casual, no-reservations restaurants. Since its establishment in 2000, Saint Pierre has been proffering an authentic culinary escape to Europe, but this incarnation sees it become more of a soulful retreat that champions rituals without being beholden to rules. In a city where restaurants open and fold every day, it’s reassuring to have a consistent place to return to, one that's underscored by tradition but not stifled by it.